"); //$("#header").prepend("Autophagy and Cell Death"); $("#navmenu > li").remove(); $("#navmenu").prepend("
" ).insertAfter( "#sidebarNavigation" ); $("a").css("color",txtcolor); $( "
Driven by the popularity and success of Oncotarget, we launched the Autophagy and Cell Death section. The Autophagy and Cell Death section publishes papers of outstanding impact and novelty in all areas of basic and translational research (mostly unrelated to oncology) and covers a variety of topics, including accidental cell death, AMPK signaling, apoptosis, apoptosome signaling, ATG proteins, autophagy, autophagy in Caenorhabditis elegans, autophagy in Drosophila melanogaster, autophagy in yeast, Bcl-2 proteins, bioenergetic metabolism, caspases, cell death in Caenorhabditis elegans, cell death in Drosophila melanogaster, cell death in yeast, death receptors, dependence receptors, ER stress, HSP proteins, lysosomal degradation, lysosomal membrane permeabilization, mitotic catastrophe, mitochondrial outer membrane permeabilization, mitochondrial permeability transition, MTOR signaling, necroptosis, necrosis, necrosome signaling, non-conventional autophagy, PARP1 signaling, parthanatos, programmed cell death, pyroptosis, regulated cell death, ripoptosome signaling, ROS signaling, unfolded protein response, and others. Submission is centralized via the Oncotarget submission system. Please choose the Autophagy and Cell Death section to direct your manuscript to the Section Editor. Instructions to authors are common for all sections of Oncotarget. 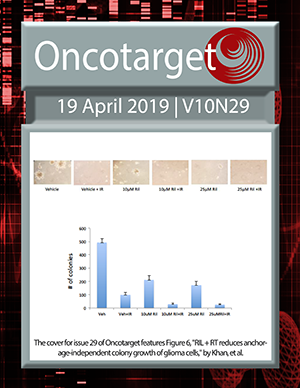 Your paper will be published in Oncotarget within the Autophagy and Cell Death section. Papers may also be communicated by members of the Section Editorial/Advisory Editorial Board. University of Burgundy, Dijon, France.